It has a stitch regulator which is a huge advantage as far as quilting is concerned. The stitch comes with two settings- BSR1 & BSR2. In BSR1 it runs continuously & is perfect for stipple quilting, patterns with curved lines or no sudden direction changes. The BSR2, however, is suited for detailed design work since in this setting the machine moves only when the fabric moves. With the Aurora 440 you can perform sewing work in a bad light environment quite easily since the machine itself provides the light required for working with it. The machine comes with an unique fluorescent lighting system which illuminates the needle area making it easier for you to work in a bad light environment. The machine also tells you when it needs maintenance. An oil can icon appears on the viewing screen when the machine needs cleaning & oiling. A screwdriver icon appears when it needs to tighten its screws. The owner’s manual is also an added advantage to the machine. It provides detailed description of the machine & its various components. It also tells you about machine settings of particular stitches. The view screen flashes graphic settings constantly. It might appear to be a little distracting to most people especially when you are doing some intricate sewing works. Also, the Start/Stop button does not work to the fullest satisfaction of the owner. This can be a little inconvenient at times. Quarter inch foot which is a common feature in most sewing machines, can’t be seen in the Aurora 440. Also, it is difficult to reach under the slide-on table to change bobbins or clean the thread race. Reviewers are really split when it comes to the Bernina 440. The sturdy construction of the Bernina means it will last long. The features mentioned in the pros section get really high ratings from the viewers. 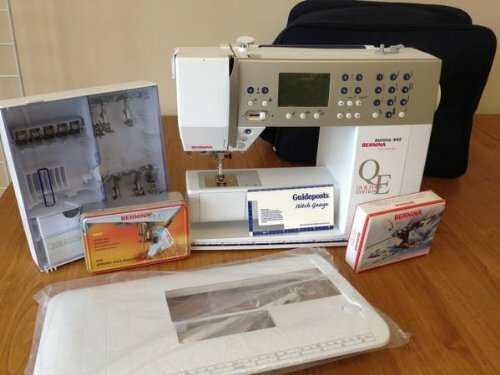 Also the Bernina brand name lures many people into buying their machines. The machine is good for quilting. But it seemed to be overpriced for a machine in its class. The automatic needle threader that Bernina is so proud of in this machine does not really work to its full potential. Even Bernina is aware of this fact & they offer you a manual needle threader to go with the machine. The slide on system also is a let down as is the accessory box. For quilters it does not offer a walking foot. You might have to spend $150 extra for this. All in all the Bernina is not a machine that you should be buying if you are into serious quilting.